We’ve all done it: sat in a meeting or in the office, at church or at a school function, staring at the screens of our smartphones. Sometimes it’s to read an urgent work email or a text message from a friend. But for many, it’s because they’re playing an online game. We don’t often associate those online games with gambling. But what happens when the lines start to blur, and real money becomes involved? Suddenly the cost of “free” games becomes expensive, and some individuals find themselves unable to control their use. IS MOBILE GAMING THE SAME AS GAMBLING? Gambling is intertwined with American culture, despite being illegal in many areas. Take this year’s Super Bowl as an example: the American Gaming Association estimates that nearly $4 billion was bet illegally on the big game. Many people are shocked to learn that commonplace activities like fantasy football are actually a felony offense in many states. Internet gambling is also illegal, except in three states: Nevada, Delaware, and New Jersey. But online games, even those with a financial component, are widely available and largely unregulated. Gambling and playing games are thought to be relaxing leisure activities, in part because they can also stimulate dopamine, a brain chemical that makes us feel good. But this can lead us to associate gaming with escaping from stress, or as a way to self-medicate to avoid emotional or physical pain. As we become increasingly dependent on our smartphones (approximately 60% of Americans own one), the potential for accessing a feel-good burst of dopamine rests in our palms. The types of games many people play on their phones are “freemium” (a combination of “free” and “premium”). These are apps you can download or stream in platforms like Facebook, and they’re all totally free to play. However, you can also purchase virtual goods with real money. These virtual goods enable you to return to the game immediately if you fail a task, or buy tools that will enhance your gameplay and make you more successful at completing those tasks. Pricing of items can range from a few dollars to thousands. The global virtual goods industry was estimated at $14.8 billion in 2012, and it has continued to rise since then. Not bad for intangible objects! One of the most popular freemium social games is Candy Crush Saga, which is often casually associated with addiction. British Member of Parliament Nigel Mills apologized after he was caught playing Candy Crush during a committee hearing in December. He’s not alone: 14% of social gamers play at work for at least one hour per day. There are also casino-style games like Zynga Poker and slot-machine games galore, often stylized after the latest trend in pop culture. Just these social-casino games accounted for approximately 11% of Facebook’s total revenue in 2014. And with 1.3 billion active users on Facebook each month sending an average of 735 million game invitations to their friends every day, the potential to recruit new players is endless. Unlike requirements for entering a casino or purchasing a lottery ticket, users only have to be 13 years old to use Facebook or download freemium apps. And even then, monitoring the age of those online is an impossible task for companies or law enforcement. It’s important we start the conversation with youth about online gaming and gambling, just like we do with drugs and alcohol. 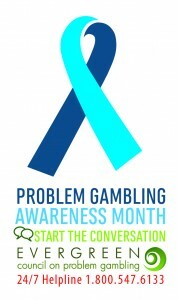 Problem gambling is a legitimate addiction. The more people are aware of the signs and symptoms, the sooner they can seek help. This is critical because less than 8% of those with symptoms of problem gambling seek treatment, due in part to a lack of awareness and understanding, fewer resources available, and the public perception that gambling addiction just isn’t a real problem. Give yourself a time and/or money limit and stick to it. Don’t let gaming, whether digitally or in a traditional casino, distract from living a full life. Understand that it’s entertainment—you can take it, or leave it. Always hope to win, but expect to lose. If it seems like any form of gambling or gaming is taking up greater amounts of your time; if you borrow money to play; or if you keep buying back in to maintain gameplay, these are signs that there may be a problem. Co-occurring mental health issues like alcohol or substance abuse and anxiety increase the likelihood of gambling addiction. Help is available, and treatment works! Kristin West is the Outreach Coordinator at the Evergreen Council on Problem Gambling (ECPG). ECPG is a nonprofit organization based in Olympia, WA that serves all Washington state residents with treatment for problem gambling, prevention programs for youth, and training for health care professionals.